How to Get Faster- what does world class look like? In this week’s blog we are summarising some of the points I made on my recent Episode 7 of Daz Dee TV. A lot of the content is already for everybody to see on this website so I’ll save myself some time and tell you all to go to the Education section of the website and look at the Speed section. Something to ponder for another show- why S&C coaches need to get better at communicating your message- it’s not just about the ‘what to coach’ and the knowledge, and why do S&C coaches get so concerned with brand equity and self-promotion. What does world class look like? 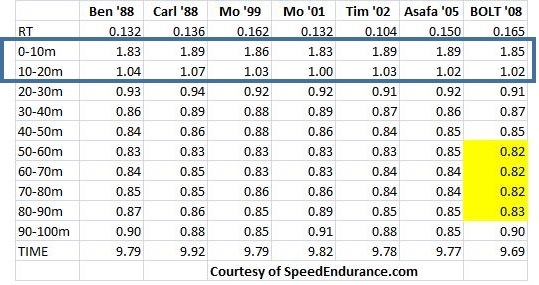 How fast do the fastest sprinters in the world run? In this episode we are setting the scene for Speed, it’s definition and some factors to consider. In the next episode we will talk about the Means and Methods to actually improve it in everyone! Speed, being a scalar quantity, is the rate at which an object covers distance. Speed is ignorant of direction. On the other hand, velocity is a vector quantity; it is direction-aware. Speed is the distance covered in a unit of time while acceleration is the rate of change of speed. The unit of speed in the metric system is meters per second (m/s) while that of acceleration is meters per second squared (m/s2). Speed is a scalar quantity while acceleration is a vector quantity. With respect to the subcategories of Speed I covered this on the Education section of the website so go check out the page for the full definitions. What does World class look like? This graph shows a couple of interesting things- it shows two clear phases. The first phase is the acceleration phase. 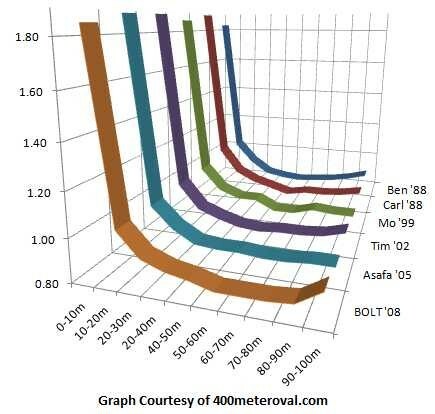 This is defined by a significant drop in the time it takes to cover a 10 metre split over the first 50m or so. When you are no longer accelerating you have officially reached top speed. It is often said that the person who wins is the person who slows down the least so this speaks to the concept of speed endurance. What made Usain Bolt’s word record so amazing was that he was able to hold on to his top speed from 50 to 100m. The Table above shows the actual data that I was referring to above. 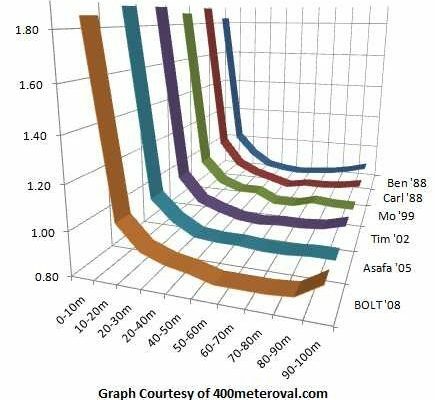 The part of the race that no one has been able to compete with was Bolt’s performance of 0.82 m/s from 50-80m. 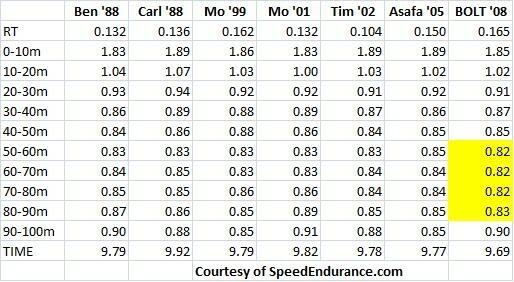 Until Bolt came along, 0.83 was the fastest top end speed recorded. 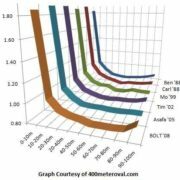 0.83 seconds per 10 meters translates to 12 meters per second (m/s) or almost 27 miles per hour (mph) or 43 kilometers per hour (kph). In the Table above I highlight the first 0-20m splits. 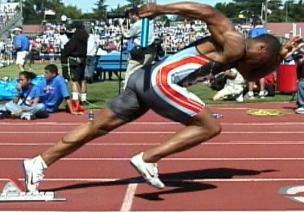 If you look at Mo ’01 he was fastest over 20m taking 1.83 seconds to cover the first 10m and then 1.00 to do the next 10m. This gave him a total time of 2.83 seconds. The fastest time I have ever recorded for a tennis player was 2.73 seconds!!!!!! What other factors affect Speed? Before you jump to conclusions that someone who ‘appears’ slow is actually in fact slow, test some of your assumptions. Perhaps they are not mentally ‘focused’ and concentrating. Maybe they are not showing the desire to try hard and run as fast as they are physically capable of. Are they starting in the right place and do they have the most efficient technique?? 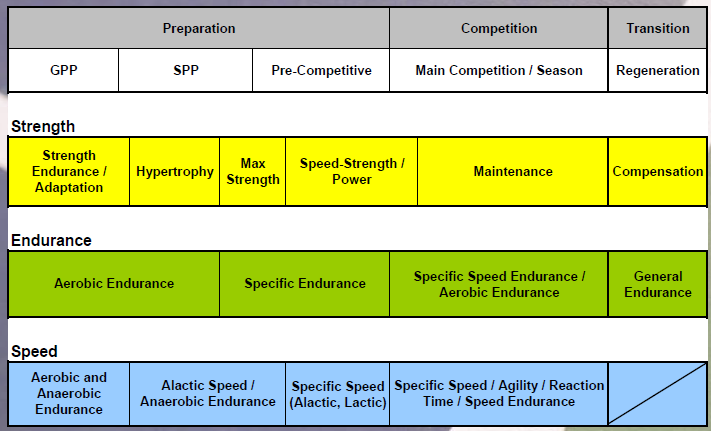 http://athleticperformanceacademy.co.uk/wp-content/uploads/2017/05/100m-split-times.jpg 414 435 dazdrake http://athleticperformanceacademy.co.uk/wp-content/uploads/2015/05/APA-Logo1-300x156.jpg dazdrake2017-05-26 06:23:552018-05-27 20:12:22How to Get Faster- what does world class look like? 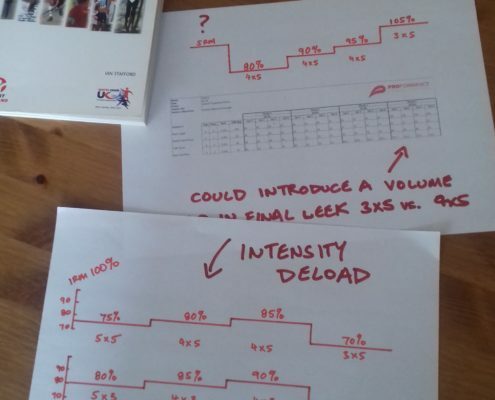 In this week’s blog I take you through the three elements you must consider when designing a Strength training programme. This links to a previous episode of Daz Dee TV- Episode 5 where I talk about writing an Annual plan. In that episode I stated that I follow a Linear periodisation model with less experienced athletes meaning they progress from focusing training on muscular endurance => maximal strength => maximal power. But, at the same time we are ALWAYS working on all components of strength all of the time; it’s just the focus that changes. So you might have a 12-week training cycle and spend 4 weeks focusing on each one. 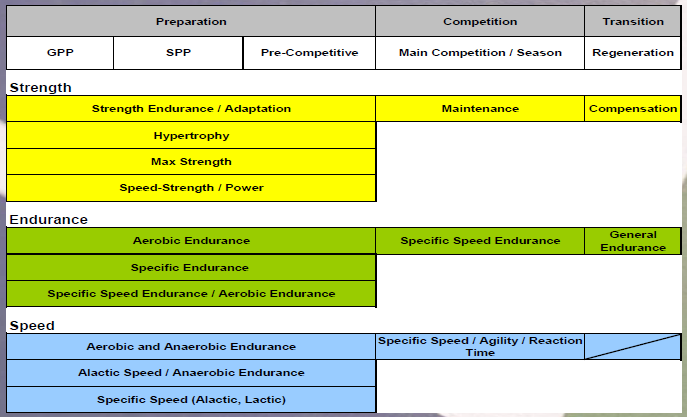 More advanced athletes who have progressed through these training cycles will follow a concurrent periodisation model meaning they would train all of the components in almost equal amounts in each training week. 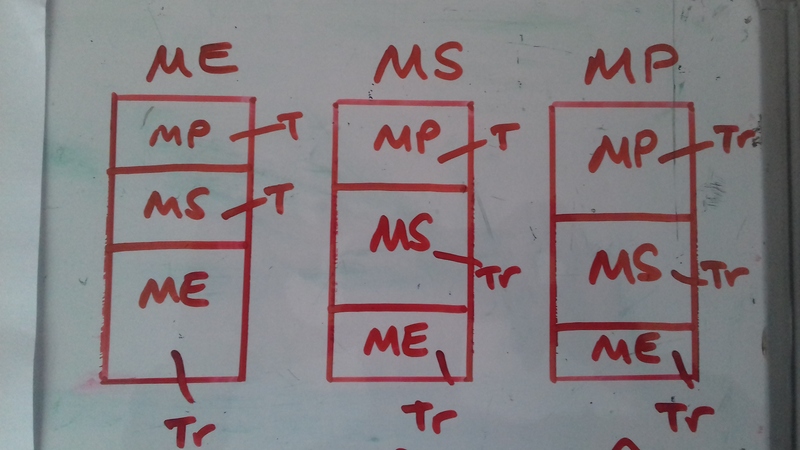 Below are two versions of an Exercise classification. The first time I came across exercise classification was through Paul Chek and his CHEK Institute, and then Kelvin Giles where they referred to Squat- Push- Pull – Brace- Rotate- Gait. 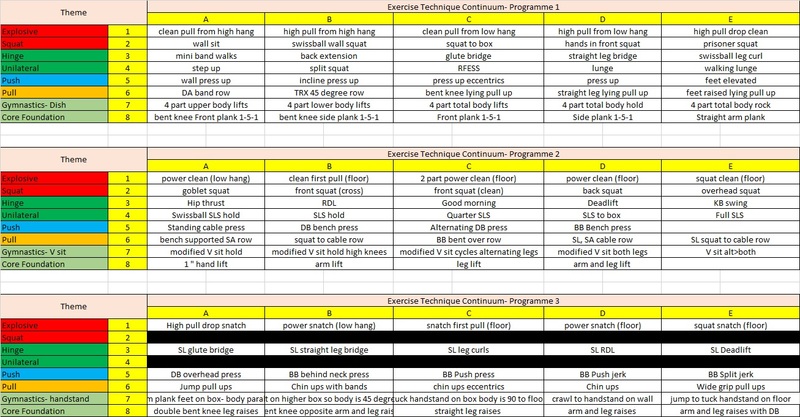 This has been divided further into Horizontal and Vertical Push and Pull and Hip and Knee dominant exercise categories. As I said in the video I have broken it down into 8 categories (but technically it’s 7 as the last two are both core variations). 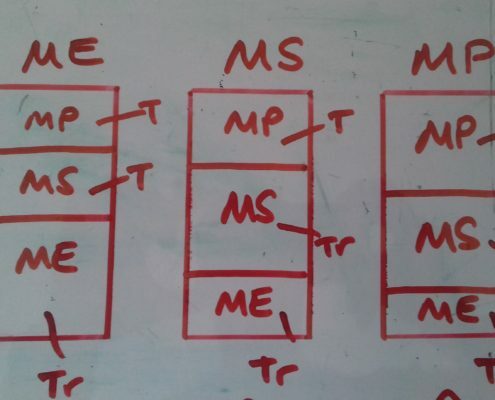 To be honest I still do have programmes where I will be working both on the vertical and horizontal versions of upper body at the same time, but I like to focus on press up then bench press then overhead press. I also like to focus on lying pull ups, bent over rows and then chin ups. So I guess you could say I emphasis horizontal strength before vertical strength. Here I break down a session into various subcomponents of strength and power. Hope you have found this blog interesting. Remember, we are running a Level 2 S&C qualification in June so if you’d like to learn more about these topics and MORE then get in touch. 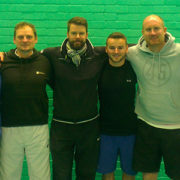 In this blog I am going to be summarising the latest Episode of Daz Dee TV- Episode 5 Periodisation. 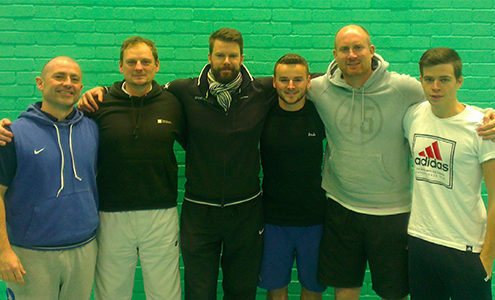 When you play sport at the highest level, you need to be in peak physical condition. 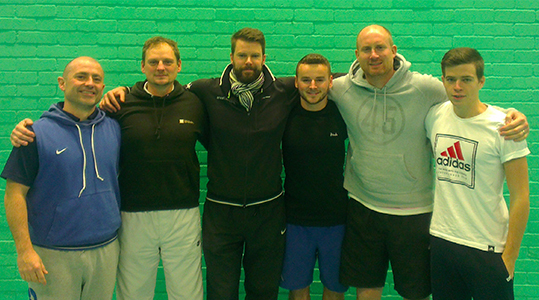 We aim to maximise your athletic potential meaning we make you Fitter, Faster and Stronger so you can excel at sport. 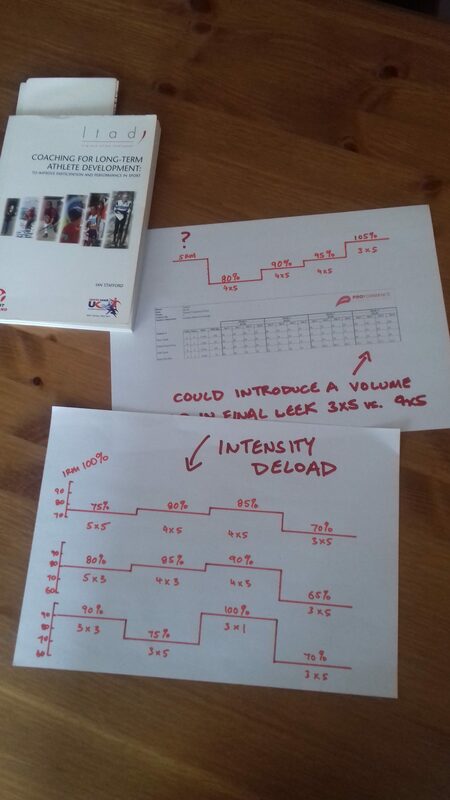 Complex Sessions– For the athletes coming 1-2 times per week we believe in training all the components ALL YEAR ROUND however it is important to have a Key Focus. Typically this will involve progressing from basic skills to more complex ones across three x 12 week terms. 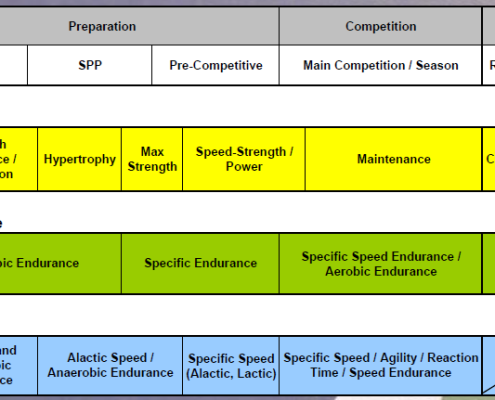 At APA you might say that at first glance the training plans we use for our more committed athletes are based on LINEAR periodisation. I can’t deny this as we clearly progress over time from those qualities that we can do in greater volume at lower intensity to those that we do at higher intensity in lower volume. This sets the direction of travel horizontally over time. However, the danger here would be to assume that we take this concept literally. That would mean we don’t do any power work at all until we come to the end of the training cycle. This is NOT what we do at APA. Rather, the Linear route map only informs us as far as what the main focus of TRAINING is. In any given moment we will also be TEACHING Max Strength exercises such as Back squats and TEACHING Olympic weight lifting exercises for Power such as the Clean. At APA we always train all components of fitness all of the time. 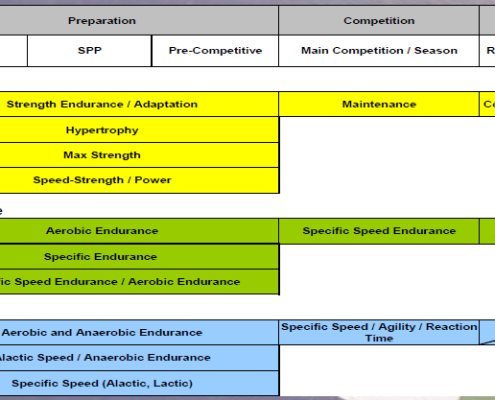 Concurrent periodisation is based on the premise that we train every component of fitness each week. However, again the danger here would be to assume that we take this concept literally. If you tried to overload ALL the components equally, if that were even possible, you would get a blunting of the training effect as there would be an interference effect. Interference occurs when the improvement in any one component being trained is reduced in relation to what would have been achieved if this area was trained on its own. Therefore we choose one or two things to TRAIN and others to TEACH. The exception is with our advanced athletes where we might TRAIN multiple components in the same session, or at least in the same week. But we would need to plan the week smartly so as to ensure we don’t try and hit too many qualities in any one day. 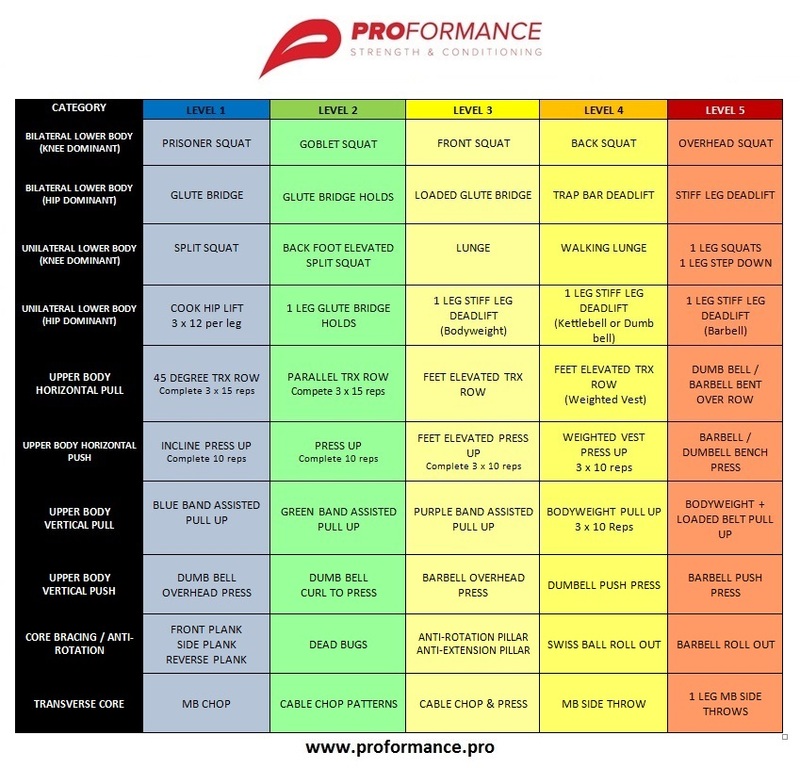 I want to give a shout out to James Baker of Proformance who is doing a great job in Youth S&C with his group in Gloucester, and I refer to an example of his training programme here. Hope you enjoyed the show!! Don’t forgot I am running a 1st4sport Level 2 S&C Certificate in June where we talk more about these concepts. Head over to the website to find out more!!! !